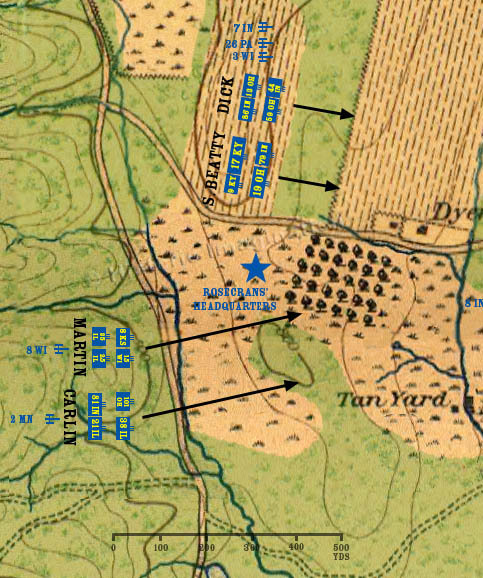 Van Cleve’s division is again ordered forward, but halts at the edge of the field overlooking the Dyer farm. Major General Thomas Crittenden, commander of the Twenty-first Corps, rides with Van Cleve's division. The three divisions of his corps have been spread to different parts of the field. The division commanded by Brigadier General Jefferson C. Davis is ordered forward to a supporting position behind Wood’s division at Brotherton Field.